SIM20 - low cost half-duplex r.f. transceiver data for peer-to-peer and broadcast transmission. 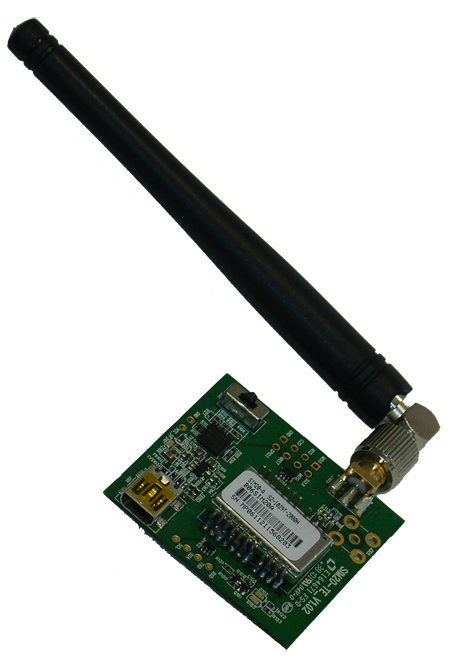 It includes a high-speed microcontroller and high-performance RF chip, ensuring that it has high receiving sensitivity, programmable transmitting power and high data rate. It supports transparent date transfer without complex configuration, with UART (CMOS/TTL), RS232, I²C/SPI interfaces. The module has an input voltage range of 3,0 to 3,6 V. It measures 21 x 13.8 x 2,6 mm, 1.5gms, and operates over the temperature range from -20°C to 70°C at 10-90% RH. Typical applications include wireless sensors, remote control/security systems, wireless metering, wireless medical telemetry service (WMTS), keyless entry, home automation, and process and building control. Up to 1500M range at 2400bps, decreases in urban areas due to buildings etc.